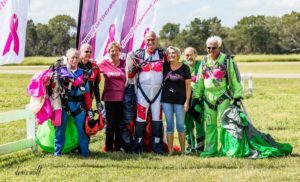 On Oct. 9 at Skydive Spaceland, in Rosharon, Texas, two amazing events occurred together—a new women’s skydiving Texas State Record was set, and nearly $13,000 was raised for The Rose, a Houston-based nonprofit breast cancer screening, treatment, and awareness organization. Two women’s state skydiving records (2010 and 2011) and nearly $25,000 raised for The Rose isn’t a bad performance record for an organization that’s barely a year old. Jump for the Rose is a nonprofit organization that was established to combine skydiving and fundraising for breast cancer by skydiver Marian Sparks, a breast cancer survivor and former patient of The Rose. “Besides being a fabulous fundraiser, this support means an awful lot of mammograms for an awful lot of women,” said Dorothy Gibbons, CEO and co-founder of The Rose. The organization is dedicated to providing screening, diagnostics, treatment, and support to all women regardless of their ability to pay for services. For example, women with health insurance who undergo mammograms at The Rose enable doctors to provide the same service for another woman who cannot pay. Since early diagnosis and treatment are key to treatment success, insured women who are screened and treated at The Rose are literal lifesavers. The new state record skydive consisted of 27 women performing three separate, intricate formations in a single skydive. The previous record set at last year’s Jump for the Rose event consisted of two formations, called points, flown by 38 women. The new record skydive flown on Sunday, Oct. 9, was dedicated to Karl Edmunds, who died from breast cancer just one week before the record was set. “We wanted to dedicate this jump to him because people tend to think of Jump for the Rose as a women’s event, but this cancer can get men too,” said Kara Latimer, owner of Rio Vista construction and secretary/treasurer of Jump for the Rose. “What better way to memorialize lives lost to breast cancer than to have this awesome living tribute?” Many men supported the event as well by buying event merchandise, purchasing raffle tickets for items donated by local businesses, flying in their own challenging skydives, and making donations. All Jump for the Rose events provide a supportive learning environment for the women involved in the jumps, featuring experienced female skydivers with several thousand skydives coaching and mentoring newer skydivers with as few as 208 jumps. This approach built the team that set a new state record even with limited skydives due to the much-needed rain that rolled across the drop zone.